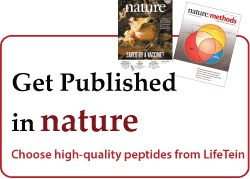 Choose high-quality products, Get published in Nature. Nature is a high-impact scientific journal that is widely read in the scientific community. If you want to learn how to orient your research toward subject areas that give you a greater chance of being published in Nature, LifeTein's advice would be: use quality products and research something you're excited about. When defining a high-quality protein product, the primary consideration for most researcher is whether the protein will work when and how needed. This “product reliability” is a measure of the probability that a peptide or protein will hold its anticipated structure and perform its required function for a specified period of time. Reliability synthesis is the method we use that is dedicated to the reliability of a protein product: more specifically, to predicting, analyzing, and preventing or mitigating synthesis failures. Product reliability is critical for meeting scientist's demands for quality protein products at competitive prices. Use the best raw materials: When it comes to product quality, we start from the beginning. Throughout our processes, we take great care to ensure that our synthesis begins with the best amino acids, resins, raw materials, and equipment. Reduce the rate of synthesis failures: The analysis of reliable peptide synthesis begins early in the synthesis process, before synthesis even begins. A technique known as Peptide Property Prediction or Calculation is used to analyze and predict the failure of synthesis over time and under various peptide synthesis conditions. The best synthesis scheme is then designed or suggested to prevent synthesis failures. Increase synthesis efficiency: LifeTein's PeptideSyn technology is a very practical platform for the high efficiency synthesis of long peptides. PeptideSyn technology allows the flexibility to select affordable, highly efficient coupling reagents for rapid SPPS. Integrated reliable synthesis to close the quality loop: Although the synthesis of each peptide is different, the mechanism behind the synthesis is similar. However the optimal synthesis conditions must be analyzed and optimized to guarantee product quantity and purity. The failure rates calculated during reliability prediction and other system design methods can be used to purify peptides using the optimal solvent and increase protein purity. Sealed-in stability: Creating a vacuum around synthetic peptides leaves no room for the problems associated with moisture-based oxidation. Sealed-in-Peptides helps prevent oxidation by sealing air out, and stability in. What are Nature editors looking for? Before preparing your experiments, you should ensure that you choose quality products and reliable services. LifeTein is the leading protein expert. Founded in 2008, LifeTein is the fastest provider of synthetic proteins in the US, with a global customer base that encompasses academia, the government, and pharmaceutical, chemical, agricultural, and biotechnology industries. LifeTein is the vendor that can synthesize by far the longest peptides, providing synthetic proteins of up to 169 amino acids to scientists. Success Stories: References using synthetic peptides and antibodies from LifeTein. Click here for more references!